The bosses of a Chinese print company believe their purchase of a new Manroland press will enable them to print better, faster and be different from their competitors. Li Sheng Color Printing, based in Taiwan, specializes in high end packaging and printing products such as cigarette packs, and cosmetic and food packages. With 120 employees, it is a leading folding paper box manufacturer on the island. They have a number of Manroland presses on their 12,000 square metre site, and have now added the R507LV +UV. Lin Yankun, the managing director, singled out the print quality – particularly in the coating application and ease of operation. He said the InlineFoiler application made his company’s finish stand out against the competitors. The General Manager Mr. Chia Sheng Lin, revealed the secrets of their success. “All of our printers in the packaging printing industry understand that the advanced printing technology is the key to success. “Manroland printing technologies, which have been leading the global packaging printing industry, enable us not only to print better and faster, but also to print differently from our competitors. Thus we are able to bring more added value to our customers. 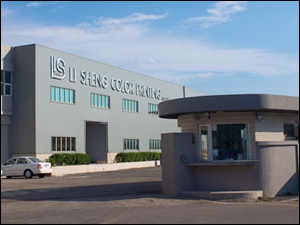 Li Sheng Color Printing, the high-end packaging printing service provider from Taiwan. Manroland Sheetfed GmbH began trading on 10 February 2012, following the acquisition of the Sheetfed division of the insolvent Manroland AG by British industrialist Tony Langley and Langley Holdings PLC (www.langleyholdings.com). Manroland Sheetfed employs approx. 1000 people at the HQ in Offenbach, Germany and around 2000 staff worldwide, in over 40 subsidiaries. For more information about Manroland Sheetfed, visit www.manroland.com.